Ribbon-like blades pour from the center of a bright rose-colored fountain. Its color changes with the seasons, from rose in midsummer to golden brown when the weather gets cooler. Bloom Time Mid to late summer. 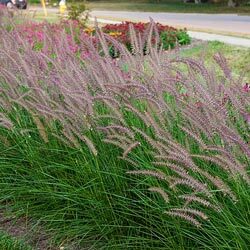 Foliage Type: Long narrow, ribbon-like blades form a rounded mound. Bloom Time: Mid to late summer. 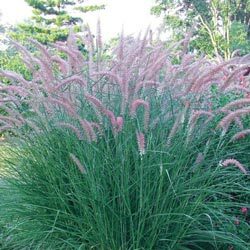 Planting Instructions: Plants need a 3-4' space at maturity because of the arching inflorescence. Soil Requirements: Light, moderately fertile soil that is well drained. Pruning: Trim back old stems in late winter or early spring. Additional Information: Great for landscape or container.